Detection and recording of recurring problems. Just Valves inspect all on-site valve equipment. Each component will be identified and recorded with its site location. Just Valves Inspect all valve equipment for leakage and damage. Any concern is recorded and if possible photographed. All valve equipment will be inspected for correct tagging. Where tags are incorrect or missing, Just Valves attaches temporary tags and records their location. 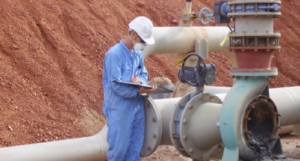 Just Valves inspects available Valve Equipment Maintenance Records on site. We recommend that an accurate and up to date maintenance log be maintained for all valve equipment. Just Valves can assist in the making and maintenance of such log. Just Valves discuss and record maintenance issues and requirements with your maintenance personal. We attend to all relevant maintenance aspects, such as equipment service life and limitations, repair-replacement issues, stock requirements and emergency supplies, ordering systems and delivery times, etc. Just Valves regard a superior supplier-customer relationship as an invaluable component of efficient operations. Just Valves inspects and records condition and tagging of valve equipment held in stock. Stock level and requirements will be assessed in accordance with data gathered in all areas of Valve Equipment Operation Management. Just Valves identifies critical valve equipment components and assesses on-site availability. For preservation of storage space and simplified On-site Storage Management, Just Valves offers external storage of customer specific valve equipment. We consult your Store Managers to coordinate packaging and delivery for your valves and equipment needs. Damages and Concerns (with photos).